Please add this email: Bill@EliteSportsCA.com to your trusted contacts so our email updates don't get lost in your junk or spam folders. Thanks again for helping out and we will see you on the starting line. Yes we will have prizes for the best holiday costume’s, so come dressed in your favorite Christmas duds and let’s see how creative everyone can get. Yes, very walker friendly course, mostly flat, plenty of aid stations, and loads of fun! Generous 4:00 hour time limit for the half marathon so take your time and enjoy the scenery, all levels of fitness are welcome at our events. Everyone will be asking…. What did you do on your holiday vacation time? Now you can show off your finisher medal and race day t-shirt. This is the race for you and everyone you know. This mostly flat two loop course is a great way to test your winter time speed! 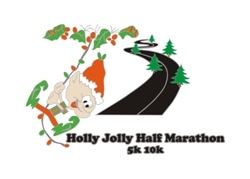 A perfect way to give yourself a holiday gift (a new PR) that you can cheer about all the way to new years.